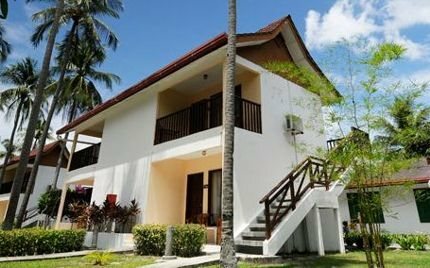 Frangipani is an excellent choice if you are looking for a 3-star category resort which is suitable for family and children, located in an isolated place but still quite convenient to be able to easily walk down to the hub of shops & restaurants. This beachside resort spreads across some 400 meters of golden sandy Pantai Tengah beach. This part of the beach is quite secluded and used mainly by the hotel guests. Earlier the property was known as Langkawi Village Resort. In 2006, the group Frangipani Hotels & Resorts Sdn Bhd had taken over the property, did considerable developments including refurbishment of rooms and villas, created additional rooms, introduced beach bistro, the lovely spa and several other amenities. The resort is known for its eco friendly practices of recycling and reusing. It is undoubtedly one of the best green & eco friendly resorts in the island. The hotel is located off Jalan Teluk Baru (aka Jalan Pantai Tengah). Although the location looks a bit secluded, all the shops, bars and restaurants of the popular Pantai Cenang are within 10 minutes easy walking distance. There is also a mini mart just outside the hotel and also a Thai restaurant. There are 117 rooms, suites and villas in Frangipani. The deluxe double rooms and the family rooms are clustered in two-storey buildings having 6 to 10 rooms each. They mostly have nice garden views with private balconies or terrace. In-room amenities include TV with select cable channels, ceiling fan and air conditioner, safe, mini refrigerator, coffee/tea maker, attached bathroom with bathrobes & toiletries, hair dryers, slippers etc. Note that the family rooms are larger and have one king and two twin beds. Iron and ironing boards are available on request. In villas, you have a choice of garden views, sea view and beach side villas. The beach side villas stand right on the beach and have sweeping views of the beach and the ocean beyond. The villas are of course costlier than the rooms. One unique feature of the villas is the semi outdoor shower. In fact in some you get wonderful ambience of the rainforest as you take private outdoor shower. Each one-bedroom villa has one king or two twin beds. The villas have similar in-room amenities as the deluxe rooms. Complimentary wi-fi is available only in common public areas such the lobby, the restaurant and near the pool. If you get a room (like #307) near the pool, you can get the wi-fi connection from the room. Sometimes the connection can be quite slow. There are two swimming pools - one is a fresh water pool and the other is a salt water pool which is free of chlorine. There is an outside Jacuzzi as well. The restaurant serves Asian (Chinese, Indian and Malay) as well international dishes. The food is average. The restaurant has wonderful views of the pool and the sea. There is an outdoor deck as well. The beachside bistro serves nice cocktails although limited. It's open day and night. Try out their signature drink - Frangipani. Other hotel amenities include spa, duty free convenience shop, mini library, luggage storage facility, currency exchange, tour desk, room service etc. It's a lovely green property, quite well maintained. Rooms are clean and quite spacious. Excellent location - lovely beach, quiet although convenient. You can walk down to Pantai Cenang which is known as the most happening place in the island in few minutes. That's where most shops, bars and restaurants are located. You can also easily get taxis if you come to the main road. Their green practices and effort to conserve the nature is laudable. The owner Antony Wong has initiated and completed a number of initiatives to conserve natural resources, putting into practice recycling and reuse of resources and ensuring long term sustainability. Some of the initiatives include rainwater harvesting and storage which is then used for garden & pool cleaning, toilet flushing etc, using empty beer bottles as lamp shades, kitchen waste is used to create compost fertilizer, onsite water treatment plant, and many more. The staffs are very friendly and the service is quite excellent. Overall a good value for money in mid-range category. Update December 2014: During the Langkawi Tourism Awards function held in the island recently, Frangipani won the Best 3 Star as well as Best Geopark Practices awards along with another hotel. They should consider extending the wi-fi to the individual rooms and villas. These days wifi is considered essential, particularly for the rates you pay here. Although the breakfast spread is nice, lunch and dinner food is average. 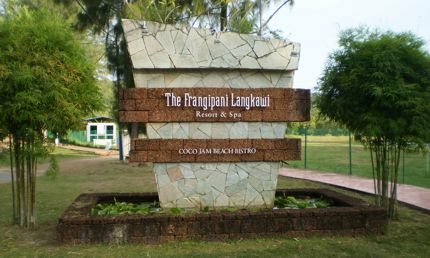 Frangipani is about 10 kms from Langkawi International Airport - takes 15 minutes by car. The shops and restaurants of Pantai Cenang are within easy walking distance. Frangipani Resort & Spa. P.O. Box 138, Jalan Teluk Baru Pantai Tengah, Langkawi.